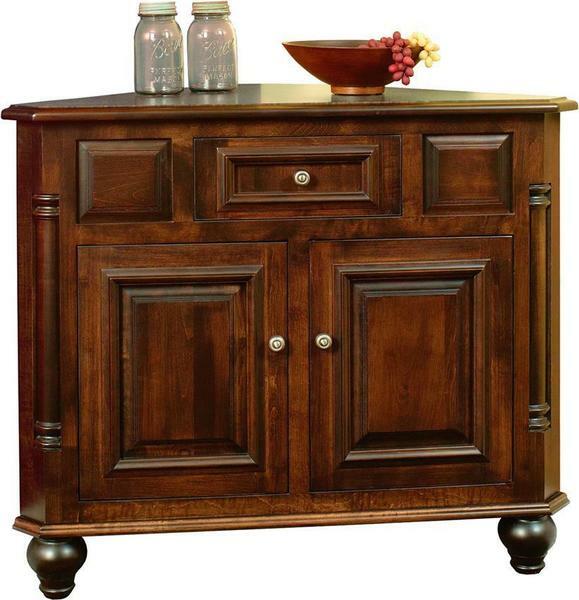 The Amish European Corner Buffet with 1 Drawer has a hefty dose of French country flair. The rounded feet and built in columns dress it up, while the raised panels are strong and gorgeous. This corner buffet can fit in where you need it as it adds room for items you'd like to store. The Amish European Corner Buffet is shown here in brown maple wood. This solid wood buffet adds delightful storage to dining room, kitchen or any corner that's best. You can customize the look with wood and finish options. Amish Furniture Specialists are at your service to help you find the best matches for wood and finish colors. Email or call us today. We can't wait to work on your new Amish furniture.Thanks for shopping with us.